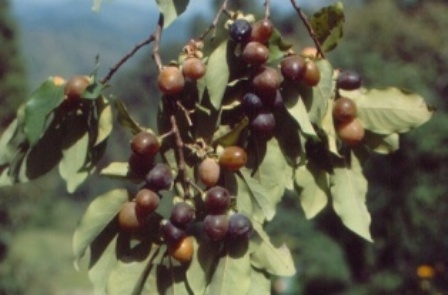 Amlook is a wild growing fruit of the North Western Himalayas. Sometimes trees are also planted. grows, mostly wild, in north-western Himalayas. Amlook is a very long lived tree and said to remain productive for centuries. It bears small fruits which are shaped like dates but having a plum like purple colour at maturity. That is why the English name for amlook is date plum. A medium sized tree growing upto 15 m; very long lived. Male flowers borne inb cymes, female flowers solitary. Fruits globose or ovoid, 1.5-2 cm in diameter; green in the beginning turning yellow and then dark purple to black at maturity, sweet, edible. Amlook fruits are sweet in taste. These are therefore fondly eaten by children as well as elders during the season. The fruit contains tannic acid, invert sugar (11.25%) and malic acid (0.38%). Exposure of unripe fruits to ethylene for 72 hours reduces the tannic content. The fruits are also dried and used later in the season. A sherbet can also be made from these fruits. The wood of this tree is grayish, close grained and moderately hard. It can be used as timber. 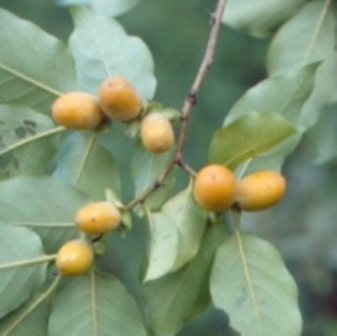 Amlook seedlings are used as rootstock for raising grafted plants of Japanese persimmon in India. 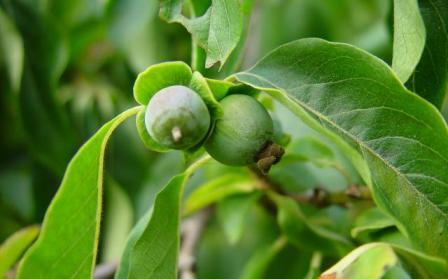 Amlook is not grown in India as an orchard fruit. 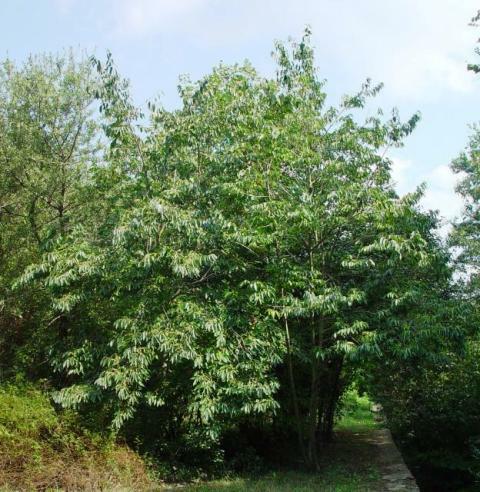 But stray wild growing trees, if found in fields or common lands, are protected for collecting fruits or seeds. New plants can be raised from seed which germinate easily.